The classic shaping of this Brass Imperial Gallic I Helm makes it a great addition to any Roman look, while its unique finish - being entirely brass in design - makes it a stand-alone piece that will surely catch the eye and interest of all who see it. The shaping of this helmet makes it a classic Imperial Gallic design, featuring a flared back for neck protection, as well as attached, hinged cheek protectors on the sides, which leave the face and the ears open. In traditional Gallic fashion, the helmet also features stylized eyebrow designs on the helms brown, too. What sets it apart, aside from the solid brass construction, is the brow visor, as well as the small decorative spike that adorns the top of the helmet. 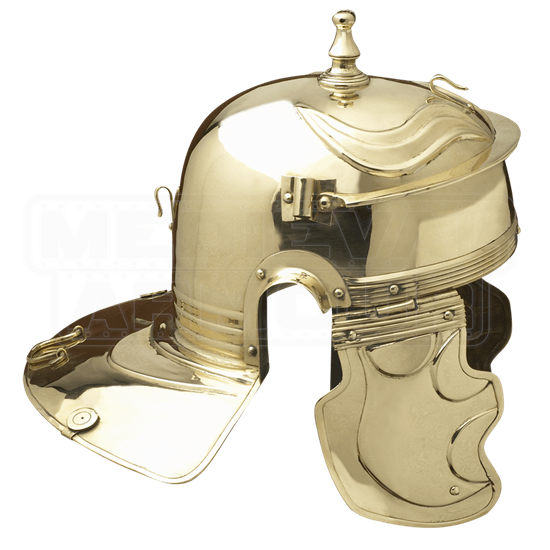 All these features, added together with the polished brass finish, make the helm a stunning piece to see, whether it is in a collection or on a warriors head! As a reenactment helmet, this Brass Imperial Gallic I Helm offers a distinctive look that is perfect for ranking officers and officials, while as a collectible, its historic design makes it a singular showpiece that will not disappoint those who see it.